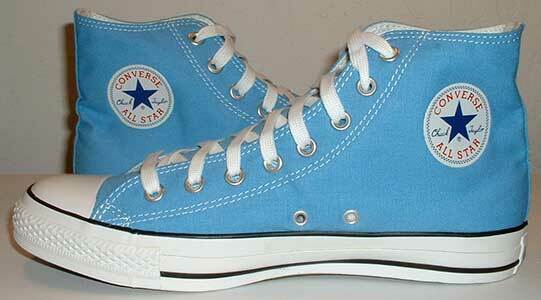 Colorful Chuck Taylor high tops like these red or Carolina blue models started a new trend in footwear. Bestow blame, or credit, on the Maryland or North Carolina teams of the early ’70s. The Terps debuted red canvas Converse sneakers. UNC donned a baby blue model. For the first time, fans — consumers — began noticing college players’ footwear. Before then, inconspicuous white or black were the only sneakers options. TV coverage of college games increased. 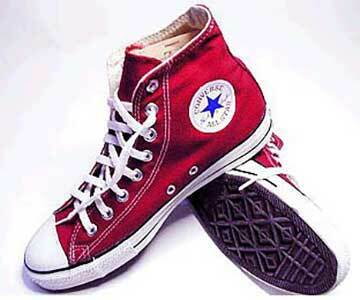 Adolescents in the Washington area wanted red Chuck Taylors, like Maryland’s. Kids in North Carolina searched for blue shoes. Converse benefited. Adidas and Nike came along, as did Pro-Keds, Puma, Reebok and a slew of other start-up companies trying to snag a slice of the exploding market. They made contracts with college coaches, paying them to ensure college teams would wear a specific brand of shoe. “The more TV time your program is going to get, the more the shoe company wants you in their shoes,” said a former Division I player in the state. The term “Shoe Wars” was born to describe the competition among sneakers makers that’s been going on now for three decades. The victors? The college coaches. Depending on a program’s position in Division I basketball’s food chain, coaches can annually make six- or seven-figure checks in addition to salaries and other perks simply by mandating that their players wear a particular brand of gym shoe. A handful of coaches make more on their shoe deals than they do from their universities. Some coaches’ allegiance is dictated by relationships they have with representatives of the shoe companies. Other coaches go for the fattest payday available. The return on this investment for Nike, adidas or their competitors: A style becomes popular among boys and girls. Product moves off store shelves. “Trust me, Nike and adidas don’t spend all of this money cause they’re stupid,” said John Averett, a former high-school coach in the state, an ex-assistant at the University of Richmond, and for 21 years an employee of Converse (sales and promotions). In the ’90s, when Rick Barnes coached at Clemson and Eddie Fogler was at South Carolina, the Tigers and Gamecocks wore Converse. That, not by coincidence in the view of Averett, was the most popular brand worn by South Carolina high-school teams during that decade. Shoe companies got product exposure. Coaches got the checks. Players got several pairs of free shoes per year, in addition to other gear. Up until the mid-’80s, most Division I coaches could count on a piece of the pie. Even at a school such as William and Mary, the coach would receive $5,000 from a shoe maker to assure the Tribe wore that company’s product. No longer is that the case. Shoe companies still spend huge money in nationwide promotional campaigns in college basketball, but the coaches at top programs are making almost all of it. Coaches from college basketball’s top-level leagues regularly make $100,000 to $1 million a year off shoe contracts. What if a player would prefer to compete in another brand? Tough, in most cases. Everybody on the team, at least the high-profile teams, wears the same make, per coach’s orders. Most coaches at schools that don’t belong to prime-time leagues no longer receive income from shoe companies. The University of Richmond’s Jerry Wainwright and Virginia Commonwealth’s Jeff Capel, for instance, say they receive no financial compensation from any shoe company. But they get free products — shoes as well as warm-up suits, bags, etc. — for themselves, staff members and players.